What's the best way to get formal input from diverse community members? I've been curious about this question for a long time. While informal involvement or input for a specific project is always useful, there's also value to more sustained participation--and the relationships and accountability that comes with it. Create special "spots" on the board of trustees for certain kinds of community representatives. PRO: gets diverse community members in positions of real authority. CON: can make people feel like second-class board members instead of equal leaders in the organization. As one African-American artist on a prominent museum board told me, "I felt even more tokenized than if I had been part of some kind of Artists' Council or African-American Council." Form community advisory boards outside of the board of trustees. PRO: creates more room for diverse community members to participate as leaders, often in areas that are more programmatic than the board of trustees covers. CON: can feel disconnected from the primary governance of the museum or can feel like a second-class board overall. Also, can form factions of different community boards representing different groups (i.e. Latino Advisory vs. Youth Advisory vs...) as opposed to an intercultural approach. I struggle with both these options. So here's the story of how we are trying to take another approach at the Santa Cruz Museum of Art & History, through a group called C3. In 2012, we tried creating an intercultural community advisory board called C3 (Creative Community Committee). We patterned it after Science Gallery Dublin's Leonardo Group - 75 creative individuals who get together four times per year to provide input on programming. C3 was a list of about 80 people from diverse networks throughout Santa Cruz--from librarians to social services to roller derby. We held a meeting every other month on a topic like "youth engagement" or "engagement beyond the museum." People opted into the meetings where they had interest or expertise and ignored those where they didn't. We always had a group of 15-50 people together for intense brainstorming. It was fairly lightweight, and it provided valuable input. But there was a problem: it wasn't a consistent body. There was no required time commitment from participants. There was no accountability for us to act on their input. C3-ers generated great and useful ideas, but they were functionally an assembly of creative individuals, efficiently giving us input. Low on friction. Low on depth. Low on long-term impact. We took a year off of C3 in 2013 and reconsidered our goals for the group. We realized that we didn't want specific programmatic input--we already get that from individual community members as needed. Instead, we wanted a collection of leaders, highly networked in different parts of our County, with their fingers on the pulses of significant community issues and activities. We believed that our museum programming would improve if we spent more time as staff members and trustees learning and working with these leaders on their projects throughout the County. Our work would become more relevant, our collaborations more timely, our network more diverse. Suddenly, C3 felt more like an engagement program that advances our institutional goals. At the same time, it sounded like something that wasn't just for us. We figured if it worked, everyone in C3 would find it useful for their own work. So we reconceptualized C3 as a creative leadership network for the community. A year-long program with an intention to ignite new collaborations across the County to build a stronger, more connected community. We're piloting C3 now with a cohort of 42, roughly following the 2014/2015 school year. We tried to develop the best leadership program we could imagine, rooted in our museum's collaborative, creative approach. We recruited people in an invite-only format, with very strict quotas for different kinds of creative leaders in the County. We wanted to end up with a group that reflects the diversity of our County across many strata: age, class, gender, ethnicity, geography, and profession. Meet them here. We required a commitment to a half-day kickoff and four out of five two-hour evening meetings over the course of 10 months. We said no, tearfully, to several awesome people who could not make it to the kick-off workshop. While C3 is open for any staff members to participate, they have to make that same time commitment too to be part of the group. We worked with C3ers at the kickoff workshop to map the issues and communities of greatest interest and connection. This map formed the basis for topic definition for subsequent meetings. Our topics are broad, including Creative Spaces, Youth Empowerment, and Economic Opportunity. We asked everyone to commit to all the meetings, including those that don't relate obviously to their work. We developed a meeting format that focuses on sparking creative collaborations to enhance projects that C3ers are already leading. A few of these are museum projects, but most are not. The museum connection is evident in the way the meeting is formatted--incorporating playful art-making, historic artifacts from our collection, and a pop up museum of "artifacts from the future" of the topic at hand--but the content is not primarily about us. We asked people to make a voluntary donation of up to $150 to help support the facilitation of C3, and snacks. We were amazed at how many people were ready to pay to support the group. We created a public site to coordinate the group and share their work. We're spending a LOT more staff time than with the previous structure of C3, mostly in the form of increased communication with members and a much more intensive approach to the facilitation and program design. Recruiting people across many big cross-sections of the community means that some topics are impossible to dive into deeply. We're discussing whether in a future year we would consider picking one topic and recruiting people across diverse networks related to just that topic. It's pretty confusing to explain what it is, why we are doing it, and why people should participate. We're working on the internal and external language, always trying to be as clear and concrete as possible. C3 members find it useful and valuable (measured via self-report and attendance over time). C3 sparks new collaborations to enhance participants' projects (measured via self-report and social network mapping). C3 helps our staff and trustees improve the museum in a variety of ways (measured via self-report and social network mapping). We'll see how the dust settles in the spring of 2015 and whether this becomes a permanent program of our museum. In the meantime, we'll keep exploring and learning with our creative colleagues across the County. 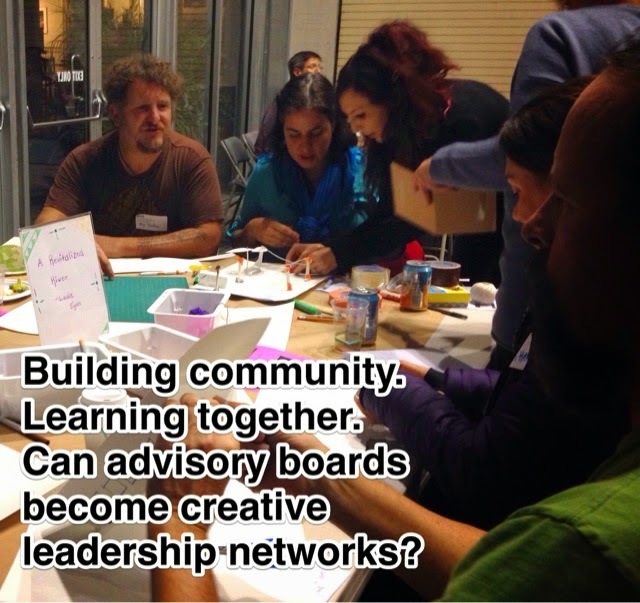 How are you exploring different approaches to community advisory boards in your work? You know those people who drop morsels of brilliance like a little kid scattering bread to ducks? I was surrounded by them last week. I'm part of a cohort of ten arts organizations in California funded by the Irvine Foundation to strengthen our work to engage low-income and ethnically-diverse people. We meet in person twice a year. These are all really smart, dedicated people, and I feel lucky to learn from and with them. Deborah Cullinan (Executive Director of Yerba Buena Center for the Arts) spoke about the change process. She compared some frustrations to "a bird flying into a window." I love this metaphor because it doesn't just speak to stuck-ness. It speaks to the fact that there is a living thing on the other side of that glass wall. There is motion. There is joy. If we can open the window, the bird can fly in. Simple as that. Jon Moscone (Artistic Director of CalShakes and son of the late San Francisco mayor George Moscone) talked about thinking politically about how we respond to criticism and to praise. As he put it: "Count the votes." If someone is negative about what you are doing, will they ever vote for you? Does their vote even matter? If the answers to these questions are "no," move on. Jon implored us to think more like activists and less like artists. Less focused on being loved. More focused on strategically understanding who is important to our cause and ignoring those who aren't. Michael Garces (Artistic Director of Cornerstone Theater) shared about a killer workshop that made him completely rethink how collaboration is supposed to work. We usually think about collaboration as a process of compromise and negotiation. But Michael suggested that collaboration really means "You get 100% of what you want. I get 100% of what I want. And we work really hard to make it work." What would it look like if you approached partnership this way? Where's the Community in the Crowd? 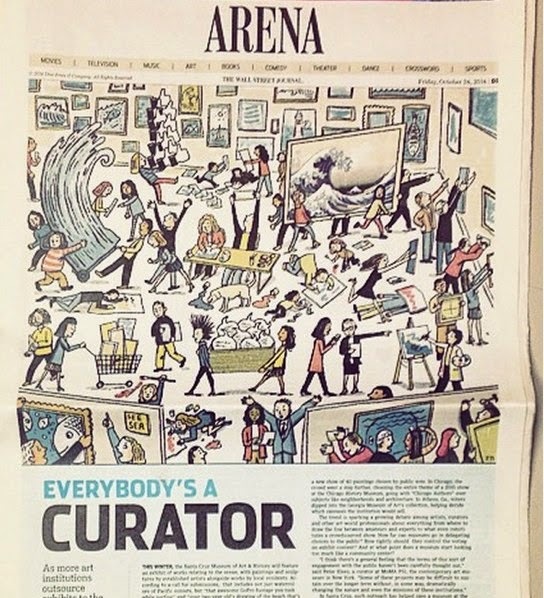 Framing and the Wall Street Journal's "Everybody's a Curator"
Two weeks ago, my museum was featured in a Wall Street Journal article by Ellen Gamerman, Everybody's a Curator. I'm thrilled that our small community museum is on the map with many big institutions around the country. I'm proud we were cast as innovators. I'm appreciative of the time Ellen Gamerman spent researching the article. I'm glad to see coverage about art museums involving visitors in exhibitions. But I also struggled with this article. There was something at the heart of it that bothered me. It took Ed Rodley's excellent response for me to realize what felt frustrating: the framing. Community is not a commodity. We don't involve people in content development to "boost ticket sales." It's neither "quick" nor "inexpensive" to mount exhibitions that include diverse community stories. Yes, community involvement is at the heart of our shifted, successful business model. But that business model requires experienced staff who know how to empower people, facilitate meaningful participation, respond to community issues and interests, and ignite learning. It's not cheap. It's not easy. It's the work we feel driven to do to build a museum that is of and for our community. Where is the community in this article? There are many curator and museum director voices in the article, but not a single quote from a visitor who engaged in one of these community projects. The curators are the humans in the story. The "crowd" is a mechanized mob. I had to imagine the deep conversations visitors had as they deliberated on which painting to vote for. The sense of pride at being part of something bigger than themselves. The curiosity about the work of professional curators and the assigning of aesthetic value. I know these people exist. I meet them everyday in our museum. I meet them doing research in the archives, collaborating on cultural festivals, and contributing stories to exhibitions. They aren't here to make our work easier or cheaper. They are here to be inspired, to get connected, to learn, to dream, to share. Despite the implication in the article, they are not all young. Our museum attracts participants who are roughly as age- and income-diverse as our County (or a little older). Our prototypical participant is a 49-year old Santa Cruz County woman with a story to share. She's proud to be part of a community. Not a crowd. The whole process of being interviewed for the story made me question the stories we tell and words we use to describe participatory work. It was easy to want to be helpful to Ellen Gamerman and fit into her context ("crowdsourcing"). I struggled to present my own alternative frame ("community involvement"). What's better: to stay on message and potentially get written out of exposure like this? Or to fit in and accept a slant you can't control? These questions don't just apply to press coverage. They apply to any situation in which we are describing our work to others. This article made me wish I had some kind of political training in framing the argument. It sent me back to the work of George Lakoff, the cognitive linguist, who traces how we use metaphors to understand the world. The metaphor for traditional art museums is the temple. Beautiful. Sanctified. Managed and protected by a league of committed, anointed ones. What is the metaphor for participatory arts? Is it the agora? The town square? The circus? The living room? The web? I don't want to be judged by metaphors of crowdsourcing or "the selfie generation." But if we want a different frame, we have to work for it. Phrases like “community engagement” or “participatory” or “social practice” are not strong enough. We need a broad and basic metaphor, one that we can repeat with clarity and confidence, across many institutions and genres and projects, to build our frame. What do you think the metaphor is for this work? What can we do to put that framing forward? , founder/CEO of OF/BY/FOR ALL, and author of two best-selling books: The Participatory Museum and The Art of Relevance.